You can save some weight and have fun by making your own head torch with a length of hat elastic, a couple of O-rings (or elastic bands) and a micro cord lock to convert eg any AAA torch into a head torch – or you can sew a couple of pieces of elastic together to create a comfy head band with an elastic sleeve for the torch (as shown) – we could have chosen lighter elastic; this is what we had. 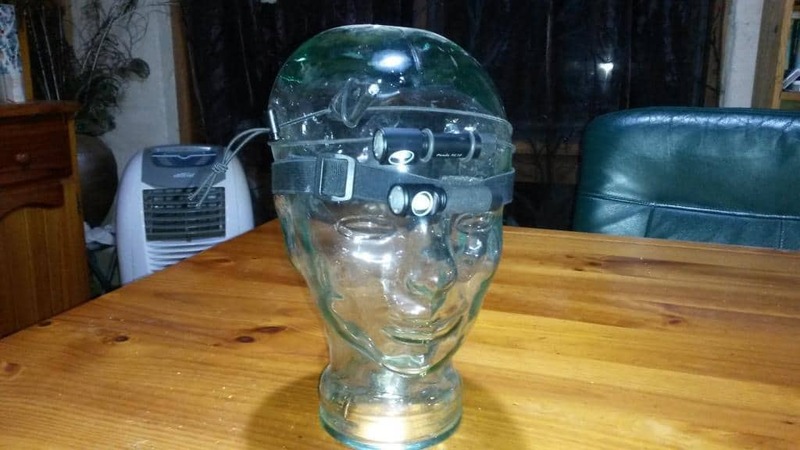 Converting the Photon Freedom http://www.theultralighthiker.com/photon-torch/ (as shown) makes a head torch which weighs a mere 9 grams (including battery)! This would be good for a day pack. Other weights: the Fenix HL10 https://www.fenixlighting.com/product/hl10-fenix-headlamp/ (which weighs 19 grams – compared to the Maratac http://www.theultralighthiker.com/mini-super-torch-a-weeks-light-weighs-50-grams/ at 11) comes with its own head band which weighs 27.5 grams. My elastic version weighs 19, my hat elastic one a mere 4 grams. The Maratac with the 4 gram head band would give you a 138 lumen head torch which weighed only 15 grams!